Books on Luther are already many, with many more being written every year. Yet, for all the research work done on Luther the man is often shrouded in more myth than reality. Heiko Oberman, the respected Dutch historian and theologian, offers a corrective to the mythical figure of Luther in his 1982 biography on the man. Luther: Man Between God and the Devil provides readers with a much-needed contextualized look at the famous reformer. To that end Oberman gives readers far more context than a traditional biography might be prone to do. His format does not follow the predictable simple chronological flow of Luther’s life, but begins at the end and follows more the movement of the broader Reformation than the man’s maturation from youth to adulthood to death. 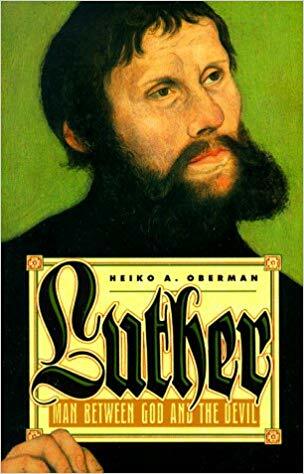 In the interest of giving readers the real man Luther, Oberman often finds himself navigating the false conclusions, erroneous assumptions, and misguided interpretations of other historians. The work is, as a result, not introductory but a bit more advanced in its content. Oberman, for examples, gives attention to Luther’s mother in a way that no other work has. He offers correctives to the psychological biography that attributes the reformation to Luther’s relationship with his father. He also wrestles with interpretations of Luther’s teaching on “freedom of conscience,” his writings against the Jews, and his relationship to German nationalism (just to name a few corrections). Oberman does a masterful job of weaving these debates into the flow of his biography without losing the momentum of the story he is telling. Luther’s views on the Devil and the influence of those views on his theological development, reformation practice, and teaching have been greatly neglected in the research. Here we are extremely prone to transport Luther to our own time and our “enlightened” views on the demonic forces. Luther, however, was very much a Medieval man in this regard. For Oberman, however, this detail of Luther’s thought is more than just an element of influence that has been far too neglected. It is, rather, essential to understand the man and the Reformation he helped to launch. Luther’s belief about the Devil is an “integral part of the Reformation discovery” (105). These are important details about Luther that the reader can learn from Oberman, and yet I fear he gives too much weight to these doctrines in Luther’s thought and life. If we have neglected them in previous research, my fear is that in Oberman he swings the pendulum completely the other way. While belief in Satan was an important part of Luther’s work, I think it does a disservice to Luther’s own teaching to elevate it to the same place as his love for the gospel and belief in Christ. The Reformation is a result not of Medieval fear, but of Spiritual awakening to the gospel. The man’s own testimony reveals this truth. Oberman offers a great corrective, but perhaps too much of one. Luther: Man Between God and the Devil is a fantastic biography, perhaps one of the best I’ve read. Heiko Oberman corrects and redirects the conversation about Luther in important ways. His ability to place man within the context in which he lived and shows the ways in which he is both a product of his time and a divergent voice within it are significant for understanding Luther rightly. If he stretches the influence of Luther’s beliefs about the Devil too far, overall the book is still an essential read for those serious about understanding Luther.